Are Zinnia and Dahlia Flowers Similar? The flowers of zinnia (Zinnia spp.) and dahlia (Dahlia spp.) are alike in many ways. They're both members of the sunflower family, or Asteraceae, with similar flower construction. The circular blooms are composed of many smaller flowers that form one large flower head. Outer flowers have petals that radiate outward like rays of the sun. The central flowers are shaped like a disk, and this is where seeds form. In some, the disk is absent or not obvious. Zinnias and dahlias both have vibrant colors and numerous flower forms. Both make good cut flowers, bedding plants, borders or edgings, and both have numerous species and varieties. Zinnias usually have yellow disk flowers at their center. About 20 species of zinnia are native to the New World. Most widely grown in gardens, common zinnia (Zinnia elegans) ranges from plants that grow 6 inches tall to upright varieties that reach 50 inches high. Flower size varies from 1 to 2 inches wide to large, double-flowered blooms 6 inches wide. Spreading zinnia (Zinnia angustifolia) has mounded growth from 8 to 18 inches tall, and golden single flowers. It's suitable as a ground cover or bedding plant. Zinnias are annuals. With over 20,000 cultivars, garden dahlias produce a wide variety of flower sizes and colors. They are tender perennials that grow from tubers and are hardy in U.S. Department of Agriculture plant hardiness zones 8 through 10. Plants grow from 1 foot to 6 feet tall. Flowers on taller dahlia varieties are larger than any zinnia flower and can reach over 10 inches wide. Large-flowered dahlias make a showy display when they bloom in summer, and plants may need staking to support their heavy flowers. In cold winter areas, dig up dahlia tubers and store them in a cool, dry place for the winter; replant when all danger of frost has passed. Both dahlia and zinnia flowers have definite categories of bloom types. Dahlias have more types of flowers than zinnias. The National Dahlia Society names 14 dahlia flower forms. Single, collerette, star and paeony flower categories have central disks. In other forms, ray flowers predominate. These have no obvious disk, and petals can be rolled, split, pointed or rounded. These categories include cactus, pompon, ball, waterlily and fimbriated dahlias. Zinnia flowers have an obvious central disk no matter what arrangement the ray flowers exhibit. Zinnia flower categories include single, double, dahlia, globe and cactus flower forms. Dahlia zinnias are double to semidouble flowers that are 3 to 5 inches wide with rounded ray flower petals. Cactus zinnias resemble cactus dahlias. Double to semidouble flowers are about 4 inches wide with curved, narrow petals. Both zinnias and dahlias have a wide range of colors. Dahlias come in white, pink, purple, orange, yellow and red, and some varieties have two or more colors in the flower. 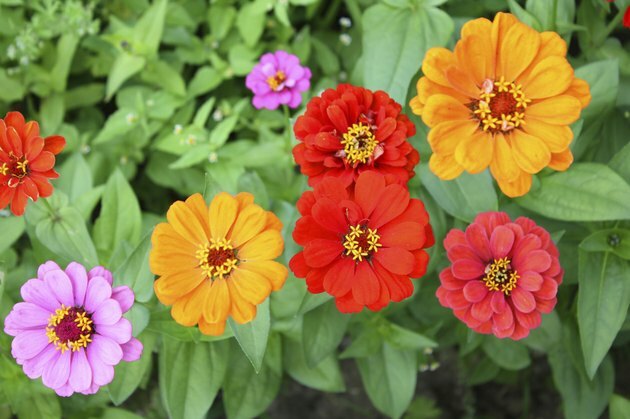 Zinnias can be red, pink, bronze, orange, yellow, green, purple, white, cream and lavender. Flowers may be spotted, streaked or speckled with a different color. Bicolored flowers have a different color on the base or tip of the petals. What Is the Difference Between a Tiger Lily and a Daylily? What Kinds of Flowers Bloom for One Day?